The status quo in Cyprus is stopping the Turkish Cypriots from integrating with the world, Deputy Prime Minister and Foreign Minister Kudret Özersay has said. “Our concern is the ongoing status quo because this means that it will continue to harm the Turkish Cypriot side”, said Özersay in a statement to Anatolia News Agency. The TRNC and Turkey had carried out a candid evaluation of the Cyprus negotiations process, Özersay said. Their main concern was the continuation of the status quo as this was harming the Turkish Cypriot side. 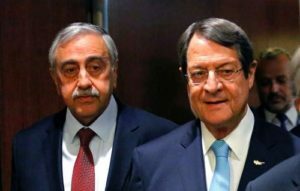 He said that after the Cyprus summit had failed at Crans-Montana, Switzerland in July 2017, the UN Secretary-General Antonio Guterres had said that both sides had to reflect on the failure of the summit and what would be their next steps. “For the negotiations process to continue for 50 years, for half a century and for it to end without success every time means that the time has come to seriously question the process”, said Özersay. “The Greek Cypriot side calling for the negotiations process to resume where they left off is actually the continuation of the status quo”, said Özersay and added that no one was being fooled by this. Referring to the report that is being prepared by the UN temporary adviser to Cyprus Jane Holl Lute, Özersay said that it would be wrong to think that the report to be presented to the UN will evaluate the 50 year old ethnic problem and will lead to the solution of the Cyprus problem. “The Turkish Cypriot side does not want to enter a new negotiation process that will not reach an outcome. It’s time to stop and question what is going on”, said Özersay. In reference to South Cyprus’ exploration for hydrocarbons in bloc 7, he said that offering tenders for the work was illegal. “The Turkish Cypriot side’s rights are being usurped”, said Özersay. Noting that South Cyprus had given permission for the Italian ENI company to carry out hydrocarbon exploration in an area that could possibly breach Turkey’s Exclusive Economic Zone, Özersay said that Turkey and the TRNC would never allow this to be realised.